For many people, age and experience tend to build character. For buildings, however, they tend to obscure and even damage the beauty and character that shone so brightly when first finished. The William J. Nealon Federal Building & Courthouse in Scranton, PA is no exception. A four-story, Art Deco-influenced Neoclassical building completed in 1931 at a cost of approximately $1 million, the federal building and courthouse had nearly 80 years under its belt when C & D Waterproofing of Bloomsburg, PA was awarded the job of restoring it's facade. In addition to green serpentine columns and limestone, brick, granite and terra cotta elements, there were 90 slabs of marble in steel frames between the window structures of the third and fourth floors in need of restoration. C & D rebuilt the steel frames, then called in the specialists at Diamond Stone & Tile Care to restore the marble slabs. To effect the marble restoration - which began in March of 2011 and ended in December that same year - the marble slabs were removed in batches of 6 to 12 slabs at a time with the use of scaffolding and cranes. The slabs were then trucked to C & D's warehouse/workshop in Bloomsburg, restored at the facility by the experts at Diamond Stone & Tile Care, then returned to Scranton to be remounted on the building. Once this process was complete of one batch, the next would be removed, sent to the workshop, restored, returned and remounted, and so on until all 90 slabs were properly restored. Restoring marble isn't just a matter of giving it a good scrub and sending it on its way. Marble is a softer stone, and can be vulnerable to erosion and damage from contaminants in the air. In the case of the Scranton federal building and courthouse, the slabs were so badly damaged from eighty years of exposure they looked just like concrete when initially removed from the building. Not only that, but it soon became obvious that the street-facing side of the marble was so eroded that the slabs would have to be restored on the building-facing side and flipped when reinstalled. Barry Raduta, owner and operator of Diamond Stone & Tile Care, remained undaunted and set about restoring the slabs to their original beauty through a multi-step process of grinding/honing, polishing and cleaning. Eight passes with diamond encrusted discs of increasingly finer grit (think sandpaper, only tougher) were required per slab and each slab took approximately 1.5 hours to complete. Remember that worn, concrete appearance the slabs had when first removed? Once they were fully restored, the slabs were a beautiful burgundy, green, white, gray, and black stone with a visual depth that looked like a 3-D effect. 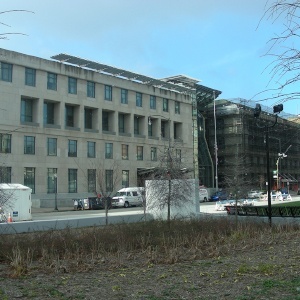 The William J. Nealon Federal Building & U.S. Courthouse in Scranton, PA is listed in the National Register of Historic Places. Both C & D Waterproofing and Diamond Stone & Tile Care are proud to have participated in this important restoration.